For the Smithing perk, see Advanced Armors (perk). 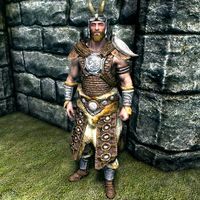 Advanced Armors is a Smithing perk that allows you to combine corundum and steel to craft two medium-quality armor types: scaled light armor and steel plate heavy armor (and with the Dragonborn add-on installed, an additional Nordic carved heavy armor and weapons). It is the second perk in the light armor branch of Smithing's perk tree. Unlocking it requires a Smithing skill of 50, and the Elven Smithing perk must have already been unlocked. 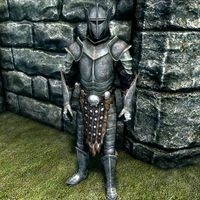 The Advanced Armors perk also causes tempering of scaled and steel plate armor to be twice as effective. This perk applies to both unenchanted armor and enchanted armor (generic armor or custom), as long as the Arcane Blacksmith perk has been unlocked. Tempering of the Helm of Yngol is also improved by Advanced Armors. 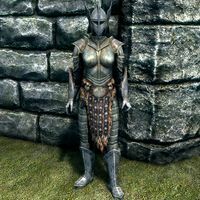 Scaled armor is a medium-quality light armor that is better than standard elven, although its cuirass is not as strong as elven gilded armor, making the two sets equal as an overall set. It appears in leveled lists starting at level 19 (enchanted varieties at level 20). All items can be tempered using 1 corundum ingot, and having the Advanced Armors perk doubles the quality improvement. The horn variety of scaled armor cannot be crafted or tempered. 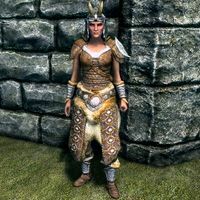 This issue has been addressed by version 1.0 of the Unofficial Skyrim Patch; This allows creation using 2 Corundum Ingots, 2 Leather, 3 Steel Ingots, and 3 Leather Strips. It also allows tempering with a Corundum Ingot. Steel plate armor is a medium-quality heavy armor that is better than Dwarven but not as good as Orcish. It appears in leveled lists starting at level 18 (enchanted varieties at level 19). All items can be tempered using 1 corundum ingot, and having the Advanced Armors perk doubles the quality improvement. 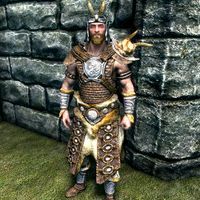 Nordic carved armor is heavy armor added by the Dragonborn add-on. It can be found in random loot and on bandits starting at level 24, both in Skyrim and on Solstheim. It can be tempered with 1 quicksilver ingot, and the quality improvement is doubled with the Advanced Armors perk. 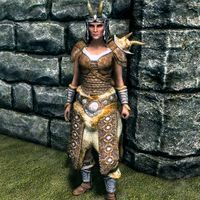 Nordic weapons are new weapons added in the Dragonborn add-on. It will start appearing at level 18 both in Skyrim and on Solstheim. They can be improved with 1 quicksilver ingot, and the quality improvement is doubled with the Advanced Armors perk. There are recipes named RecipeArmorSteelPlateShield and TemperArmorSteelPlateShield found in the Creation Kit, which may mean that at some point during development, a steel plate shield was to be in the game. This page was last modified on 29 May 2018, at 19:00.